Vincent Van Gogh has always stood apart from his Post-Impressionist peers by being so …expressive. A key instigator of that late 19th century art movement, he has come, over time, to transcend it. His wildly rich, colour-enthused style is perhaps the most recognisable in the history of modern art. His unfortunate struggle with mental illness is infused in the enigmatic impact of the works. Loving Vincent aims to explore that enigma and pay tribute to the vibrancy of his method via a freshly realised journey through his most iconic images. It’s a portrait that succeeds with flying colours. A teenage apprentice gets drawn into investigating the hazy circumstances surrounding the artist’s death about a year after the shock of the news has sunk in. Postman Chris O’Dowd (playing above age through a spectacular behemoth of a beard), asks his son to deliver a last, long overdue letter from Van Gogh to his brother, Theo. We then travel alongside young Roulin (Douglas Booth) as he visits their home town in search of his brother, piecing together Van Gogh’s last weeks through the recollections of those who either knew, supported or ‘tolerated’ him. Saoirse Ronan, Helen McCrory, John Sessions and Aiden Turner all bring natural, down-to-earth life to the locals who populate his illustrations. Eleanor Tomlinson, particularly, sparkles like a starry night as the effervescent innkeeper’s daughter who puts him up, sometimes putting up with his constant questioning. Questions which all seem to lead back to one individual: the medical guardian turned close friend of the errant painter. As key witness to Vincent’s decline, and his chief confidante, the doctor is the cornerstone of this suite of impressive impressions. When we do finally catch up with him it feels like the crux moment. ‘Portrait of Dr Gachet’ (the picture to become the most financially lucrative of his legacy) is authentically reproduced, looking quite stunningly similar to Jerome Flynn. Or is it the other way round? His casting is a masterstroke, such similar facial features coupling with Flynn’s gruff warmth being most hearteningly satisfying. 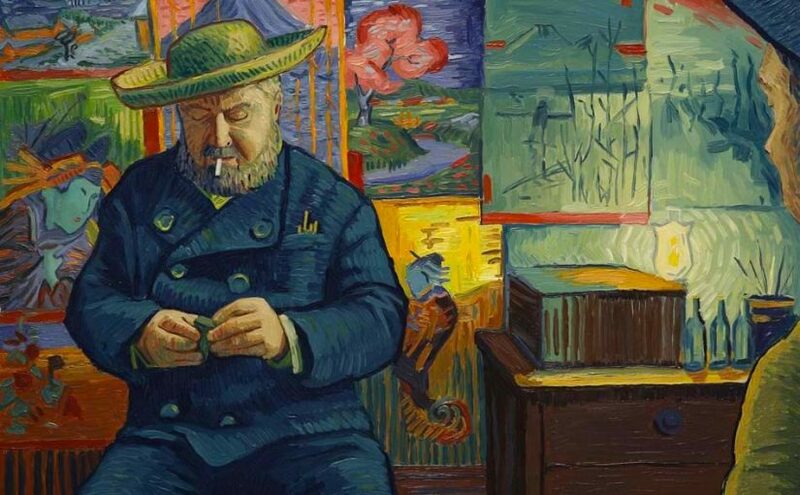 Loving Vincent is both an eloquent introduction, and a superb study aid for students of art, as it weaves together his primary pieces, his groundbreaking individualism, and his tortured desire to leave a body of work that does justice to his emotional state. ‘Cafe Terrace at Night’, ‘Church at Auvers’ and ‘Wheat Fields with Cypresses’, among others, become the blended backdrops of the story, rewarding those already familiar. And presenting the ‘flashback’ scenes of his final hours in simple black and white is supremely effective, stimulating us back to ‘the present’ each time with a rush of reinvigorating colour. It might not aim to answer the uncertainties that arguably still hang over his demise. But, through the works themselves, it expresses the anguish that was driving the production of such vivacious imagery. The title is a riff on how he signed off the many letters to his loved and admired brother. But Loving Vincent does indeed adore Van Gogh, and evangelises that love in the most sweet and welcoming way. We may never reach the truth of such an inscrutable figure, but a fresh fascination has been beautifully re-drawn. Thank you. Makes me want to see it!